A Time for Tariffs in the Globalized World? Is NAFTA a Bad Deal for America? There seems to be only one man in all of America who thinks the NAFTA agreement between the three North American economies is a bad deal for the United States. Which would be a very ordinary thing except that man happens to be the president of the United States of America. At least for now. The one great thing about the American electoral system is that U.S. presidents can serve only two concurrent terms in office, so no matter how bad or popular a U.S. president is, he or she can stay in office for a maximum of 8 years. Although nothing prevents them from running for their old job once another president has served, other than the fact that American voters have never returned a previous two-term president to office. That law is a tiny part of what makes the United States exceptional in the world. The most meritorious or most popular presidential candidates rise to the top — but unlike other countries where leaders can serve several terms in office — the American system is refreshed by new leadership every 4 or 8 years. And that’s what makes America great. ‘New blood’, a ‘new vision’, a ‘breath of fresh air’, or however you wish to describe it, occurs at regular intervals. No wonder America is exceptional! It’s too bad they don’t do the same thing with members of the Senate and Congress — and yes, even the office of Mayor in every U.S. city. If they did, the United States would be twice as exceptional on account of all that new blood and fresh enthusiasm. Alas, because only one office in the land is refreshed regularly, America is great from the top down only — not up and down and in the middle — at least where governance is concerned. President Trump arrived on the scene 13 months ago and with no particular government experience behind him, declared that many things are wrong with America and he’s just the man to fix it. And he may be that man, but only time will tell. Yet, we’re seeing a man who sees symptoms and sincerely wants to treat the symptoms instead of wanting to solve the underlying condition that created the symptoms in the first place. Certainly no one can fault Donald Trump for being enthusiastic about America, about America’s history in the world, and no one can deny he’s a breath of fresh air to the Oval Office. But we need to have a conversation about the present symptoms in order to ascertain what the underlying condition may be in present-day America, and for that, we must travel back in time to see how America lost its way. Henry thought that ‘everyman’ should own an automobile, instead of only railway barons with their obscene personal wealth able to afford motorized transportation. During a downturn in Ford company fortunes, Henry decided to increase the pay of his workers to $5.00 per day, and was thereafter able to cherry-pick whatever workers he wanted from Louis Chevrolet, Buick, General Motors, Cord, Packard, and others. Once Henry had created a whole new economic classification which later came to be called ‘the American middle class’ so many people bought Ford vehicles that 16.5 million Model T’s were produced in less than 20 years of production. The moral of this story? Paying higher wages created ‘the middle class’ — a growing cohort of workers earning good wages and able to afford a car, which catapulted Ford’s fortunes into the stratosphere. Early in the 20th-century, the U.S. became the most powerful manufacturing nation in the world and surpassed even longtime patent leader Germany as the country that received the most annual patent applications. This occurred only because of strong patent law in the United States. Any inventor with a worthwhile invention brought their idea to America for one reason — because out of all the countries in the world only the U.S. offered the maximum level of legal protection for their idea, design, system, or machine. Even German scientists brought their ideas to America to have them registered with the U.S. Patent Office! For countries other than America, the existence of a strong U.S. Patent Office created a ‘brain drain’ in their own countries, meaning that all their scientists and inventors headed to America instead of registering their contraptions in their home country. Having received their patent protection in the United States, it was a natural step to have their inventions manufactured in America. Although not its primary mandate, the U.S. Patent Office was often excellent at matching inventors with such suppliers or manufacturers as they required. It was a clear case of the American government passing the right legislation at the right time to attract the best and brightest in the world. The moral of this story? Not a tariff in sight! All of which worked to make all those patent-holders and their manufacturing companies obscenely rich. And good for them! When you work hard, you should see a positive return for your effort. The favourable consequence of powerful U.S. patent protection combined with a huge and growing manufacturing base, created a booming economy and concomitant high consumer confidence which provided an unexpected result — usually about 9 months later. Yes, during the boom times when one family member earned enough to support an entire family, the birthrate in America skyrocketed, creating even more demand as Americans began to have more children per fertile woman. The moral of this story? When one breadwinner could support a spouse and up to 4 children, afford a new car every 3 years, a couple could own their own home via a 10-year mortgage and enjoy a refreshing vacation every year, the American economy was operating at full output! In the 41 years leading up to 1974, the Saudi government had been selling their oil to America for only the price of production (sans profit) as their contribution to the Cold War effort. Interestingly, they were allowed to reinvest their cost of production payments in crude oil deliveries and refined oil products — so although they made zero profit on the crude oil as it came out of the ground — they were able to amass considerable wealth by speculating on oil stocks. But that ended when it was perceived by the Saudis in 1973 that America was favouring Israel, a country that had never delivered billions of barrels of free oil to America. Which is why the Soviets thought they could successfully invade Afghanistan and tone the world’s opium supply down to almost zero. When the Saudis suddenly wanted to be paid for their oil and they simultaneously lowered their Cold War commitment to America, the U.S. economy slowed. With 20/20 hindsight, the ensuing economic disaster was only a symptom of a bungled foreign policy that caused a dramatic increase in new car registrations of foreign cars (with their better gas mileage) moving from 4% of all U.S. new car registrations in 1970 to 65% of new car registrations by 2017. Not only that, but up to 75% of the parts used in today’s American cars are made in Asia. Therefore, the problem clearly isn’t NAFTA which came into effect in January 1994. It could be argued that the United States took a highly principled stand on account of the people of Israel, but it was America’s decision alone, and it cost America 10 trillion dollars and poisoned relations with their oil-producing and Cold War ally, Saudi Arabia. The moral of this story? The problem of offshoring American manufacturing jobs began in 1973 due to an American foreign policy decision which took place long before NAFTA had been created. Blaming Japan for American capital flight since 1974, or blaming NAFTA (which wouldn’t be created for 20-years) is disingenuous. A lost generation occurred in the 1960’s where The People lost faith in their elected representatives, but they didn’t lose faith in the institutions of government. President Carter worked to restore the faith the American people felt toward the executive branch of government by working on some very noble causes and meeting with some success. President Reagan moved things forward by strengthening the U.S. economy, infusing Americans with newfound confidence by offering loan guarantees to struggling American automobile manufacturers and dramatically increasing military spending. The moral of this story? President Carter and President Reagan didn’t fix America by blaming other countries — they did it by empowering American citizens with tax changes and supporting American industry with loan guarantees to at-risk corporations, with huge defense spending increases, and plenty of positive exhortations about what made America great in the first place. If NAFTA was so grievous to be borne, why did almost every CEO in North America want NAFTA? But some U.S. Congressmen and Senators were nervous prior to NAFTA on account of so many job losses in the American economy since 1974 and they were concerned that even NAFTA could go wrong. And let’s face it, some members were creating a negative stir so that new U.S. president Bill Clinton would feel compelled to direct more federal funding to their districts in advance of the accord, in case NAFTA failed. In reality, the only U.S. and Canadian companies that lived in fear of NAFTA were ones that didn’t keep up with the times. In the booming 1980’s and 1990’s economy, some companies decided they wouldn’t modernize and consequently continued to spend millions per month on electricity costs (for example) instead of reinvesting their (then record) profits in newer, energy-efficient factories or foundries. For other corporations in the mergers era, it seemed a time to slow capital spending in order to maintain high profit margins and pay record-high dividends to their shareholders. But when the bull market finally came to its end, many businesses were suddenly cash poor and couldn’t afford a new, energy-efficient factory or foundry. Which was brilliant tactical thinking, but abysmal strategic thinking. So… the question is; If corporations employ poor strategic thinking, should taxpayers be forced to bail them out? Why should U.S. taxpayers bail out industries that choose high shareholder returns over sound financial management? In the 1970’s and 1980’s, some American automakers needed the federal government to subsidize them with billions of taxpayer dollars to save them from implosion. That’s only one example out of thousands of U.S. companies that accepted or have lobbied for federal subsidies. Canada is just as bad as the United States on this point. Governments in both countries spend more on corporate welfare than they do on citizen welfare — times two! Now in 2018, President Trump wants American taxpayers to pay even more for their cars (and anything else made of steel or aluminum) via a 25% tariff on steel imports and a 10% tariff on aluminum. For one example, Trans Canada Pipeline will be forced to pay the tariff on the steel pipe for the proposed Keystone XL pipeline. Although steel is a small part of the overall cost of building a pipeline, the cost of the multi-billion dollar project will now rise by 5% or more. Just for comparison, 5% on 10 dollars is 20 cents — but 5% on 5.4 billion dollars adds 270 million dollars to the overall project cost. Is there ever a good case for tariffs? In a word, yes. Everything that’s imported into the U.S. (or any country) should face a globally standardized 5% tariff because every government needs money to improve port facilities, to streamline customs, and to maintain the transportation corridors that are essential to trade flows. Even countries with free trade agreements like the NAFTA countries should institute a standardized 5% tariff on every good that crosses their border — and be required by legislation to use that money to improve transportation corridors and border security. Consumers would find that presently high tariff items would drop in price, and zero tariff items would rise by 5%, but the trade-off would be astonishingly better roads, bridges, tunnels, rail links, airports and seaports, complete with better security. Every citizen would like to spend fewer hours per week stuck on congested highways, in airports, and enjoy faster and more secure delivery of goods. Suddenly we wouldn’t be talking about ‘trade wars’ we’d be talking about improved trade, improved infrastructure, and a complete standardization and levelization of tariffs between every country. And instead of heated rhetoric from politicians, we’d become more efficient throughout our countries and less efficient corporations wouldn’t continue getting rewarded for not re-investing in their businesses. Let us never forget that it was North Korea, acting with the approval of Soviet leader Joseph Stalin that attacked a peaceful South Korea on June 25th, 1950 — an invasion that was opposed by all UN member nations except China, which later provided significant support to the North Korean side. In all, more than 2.5 million civilians and over 1 million military personnel were killed (some 32,975 military personnel are still listed as ‘missing’) for a likely total of 3.5 million deaths attributable to the Korean War. However, a since reclassified report said that 4.4 million deaths occurred as a result of the Korean War (and that number includes those who died from lack of food, water, medicine, or proper sanitation as a direct result of the war) and the responsibility for those deaths lay squarely on the people who initially approved the unprovoked invasion of South Korea: Kim Il-sung of North Korea, Joseph Stalin of the USSR, and while providing only minimal support at the beginning of the war it was China’s Mao Zedong who provided a dramatic increase in men and matériel to fight the UN force defending South Korea. Since July 27, 1953 an armistice has remained in place between North Korea, China and Russia on one side of the conflict, and the countries of the United Nations on the other. NOTE: An armistice is regarded as a state of ‘ceasefire’ and is also called a ‘cessation of hostilities’ but it isn’t an actual long-term peace agreement. From June 1954 when the official negotiating teams representing both sides wrapped up their work because they were unable to forge a long-term peace agreement due to the intransigence of North Korea’s political leaders (although North Korea’s military agreed on the need for a durable peace agreement during negotiations in Geneva, Switzerland “the Geneva Conference (1954)” and in fact, covertly floated the idea of UN powers helping them to stage a coup in North Korea) the Korean War hasn’t officially ended, although it’s important to remember that there has been no actual combat between the two sides in all those years, but there have been many instances of irritation between the former combatants. In North Korea, the war never ended. At least the war mindset never ended. It’s a country that still prepares for war and it’s a country that expects to be attacked on any given day of the year. The economy is a ‘war economy’ which means that aside from growing food to feed its citizens and building homes to shelter them, everything is geared towards preparing for war. ‘No country in the world could successfully invade and occupy North Korea’ it has been said by many experts. Every adult in the country has served a minimum of seven years in the North Korean military, and some have served their whole lives. The standing army numbers 1.1 million with another 7.7 million army reservists that can be called-up instantly. Every city, every village, every building, every street, every farm area has been designed to favour the defenders, including some bridges, buildings and roads prewired with explosives to destroy them and there are estimated to be as many as 20-million land mines installed in forested land and in (what appears to be) agricultural belts. When you add that to the fact that every adult has served in the army and knows where to access those controls and their associated explosives, it makes war in the north a virtual death trap for any invading army, no matter how large or powerful. All of their serious military facilities are deep underground — so far down that only repeated direct hits with nuclear weapons will shake those underground buildings enough to kill everyone inside. And even then, some may still survive if they’re strapped in and not bouncing off the walls or ceilings hard enough to break their necks during the shaking. And if they’re alive, they can still push buttons. The kind of buttons we don’t like. The North Korean air force is small and it has few 4th and 5th-generation aircraft, but it’s designed for, and their pilots are expert at, the close air support role, which is another important factor to consider for any country considering invasion of North Korea. The North Korean Navy is tiny, but the ace up its sleeve is a large fleet of highly-modified Kilo-class diesel-electric submarines, some of which have been modified to accept ballistic missiles (although every attempted launch to date has failed) and the Kilo’s are generally noted for their stealth and are notorious for their ability to covertly deliver troops or supplies to any coast in the world. The USSR built hundreds of these small, but excellent submarines and conducted secret operations on every continent. Yes, every continent. The Soviet Navy never installed ICBM missile tubes in Kilo-class subs, but the North Korean navy did. So, it’s just a matter of time before North Korea figures out the technical bits related to launching ballistic missiles from underwater. NOTE: The Soviet Navy preferred to create a whole new class of submarine (the Akula-class) from which to launch ICBM’s and was an excellent decision from every conceivable safety standpoint. The book on North Korea’s military is this: ARMY: The army is an extremely well-trained and capable army — one of the largest in the world — and it is well dug-in and the entire country has been set up to foil invasion. AIR FORCE: Small, but extremely well-trained for the close air support mission, and very capable in that role. NAVY: Small, almost non-existent surface fleet, but well trained for coastal reconnaissance — but their submarine fleet is large, with growing size and capability, and their capabilities are regularly underestimated by other countries. Now that North Korea has admitted to having a small number of nuclear bombs and is testing advanced missiles, its leader has decided to use his nation’s war economy and military to get what he wants for his country. That’s the basic psychology at work there, and we’ve seen this before. In fact, every war begins the same way. Except, because negotiations between the UN nations and North Korea have been practically non-existent, nobody really knows what Kim Jong-un wants! Obviously he wants something or he wouldn’t be firing nuclear-capable missiles across Japanese airspace or threatening the United States with nuclear missile attack. There’s no doubt that he will continue to improve the technology and capability of his submarine fleet. There’s no doubt his ICBM programme will continue to improve and there’s no chance of staging a coup in that country as the citizens and the military command are simply too loyal to the ‘Dear Leader’ as he’s known to his people. So, as we’re stuck with him until he eventually passes away and North Korean politics becomes a lot more mainstream, we might as well engage in some high level diplomacy and find out what he wants. Perhaps he has some legitimate grievances and not-as-legitimate grievances, and some reasonable requests of the international community. It costs nothing to talk. But not talking might result in nuclear war, especially if the present lack of communication continues past the time that Kim Jong-un’s ICBM’s become nuclear-capable and can travel thousands of miles. Who Should Talk to North Korea? In the war that was the Korean War, it was the UN member nations (with the exception of the USSR and China) that fought back against the North Korean invasion of South Korea — therefore, it was a war between the UN (minus two members) and North Korea — and therefore, any diplomatic initiatives which at this point are strongly advised, must be presented to North Korea by the United Nations. At present, there’s nothing. Not even a weekly phone call. Which is very distressing if you’re a person who happens to know what the stakes are. In the long run, if the rhetoric is kept to a low level and if high level diplomatic engagement becomes a number one priority for the United Nations negotiating teams and communications staff, and if reasonable requests from Jong-un are approved, all of us, including those in North Korea, will get to live. Yes, nuclear war is like that. Constant diplomacy works every time but only because diplomacy takes place between human beings on both sides of any issue or conflict — and not between opposing computers. The application of professional diplomacy to any problem can solve anything, given enough effort and time. It’s just that it takes a high level of commitment to stick to it, and each and every action (not words, but actions) taken by the Jong-un regime will need to be carefully weighed and North Korea ‘punished’ or ‘rewarded’ as appropriate, using ‘soft power’ only, and we need to realize it’s going to take some amount of time. The best way that human beings learn anything is via ‘carrot and stick’. Reward a person (even foreign dictators) every time they do something right (within reason) and punish them every time they do something wrong (within reason) and you are training that person to be your ally. Yes, with the right diplomacy, time is on our side. One of the reasons that I’m a Theresa May fan is that she took a highly principled position by calling an election prior to Brexit, presumably to further legitimize her premiership with voters and thereby gain a stronger negotiating hand heading into Brexit negotiations. Prior to becoming Prime Minister, Theresa May had been an MP for 20 years and served as Home Secretary for 6 years — and only then was she named to the post of Prime Minister by the Conservative Party when former PM David Cameron stepped down. Which is to say, Theresa May is as legitimate as any UK Prime Minister ever appointed (but not elected to) the PM’s chair. Nevertheless, at the most important political moment in since the end of WWII, Theresa May decided to further legitimize her premiership by calling a snap election and (hopefully) cause her party to rally ’round her in time for the upcoming Brexit negotiations. Thereby empowering Britain in its dealings with the European Union. By any definition it was an admirable plan. Except for the Conservative MP’s that didn’t campaign hard for her and were only interested in maintaining their position as a Member of Parliament, and excepting the millions of former UKIP voters — only some of them supported the Conservatives on election day. All in all, a surprising result. Perhaps three terrorist incidents in the UK within 90 days of the election changed the mood of the electorate, or maybe when confronted with an actual Brexit complete with veiled threats emanating from some EU capitals it’s possible some British voters felt cowed into lowering their Brexit expectations. If so, that would be a shameful indictment on the British people, the people who succeeded admirably even after suffering horribly in two world wars and are a people who carry-on through all manner of terror attacks, other social upheavals, recessions, and Britain’s famously inclement weather. How to do more, with less? That’s the job facing Prime Minister Theresa May over the next five years. It’s an unenviable position for a longstanding British MP (20 years) with 6 years as Home Secretary to her credit and 1 year as Prime Minister of the United Kingdom, who deserved better from her party and from voters. At least 42.4% of UK voters agree with Theresa May (see BBC election chart here) which was a gain of 5.5% for the Conservatives since the last election when David Cameron became Prime Minister. The business community likes the progress on the economy, and she is highly regarded by foreign leaders. She deserves better than she’s gotten. But just for the record, let’s look at a July 17 poll result from an internationally recognized polling firm. One year on from the Brexit vote and business sentiment remains high (Says it all, doesn’t it?) Click image to enlarge. One thing that Britons have every right to be proud of is the National Healthcare Service (NHS) and in recent years it has begun to score well in the prestigious Commonwealth Fund rankings. In fact, the 2017 ranking puts the NHS in 1st place over 10 other wealthy nation healthcare systems. But you’d never think it because (according to some) the NHS is falling apart at the seams. Just as former PM David Cameron was rightfully proud of the 2013 Commonwealth Fund ranking (1st place) so Prime Minister Theresa May should feel proud of the 2017 NHS ranking (1st place) even as some of the countries named in the study improved on their 2013 rankings. 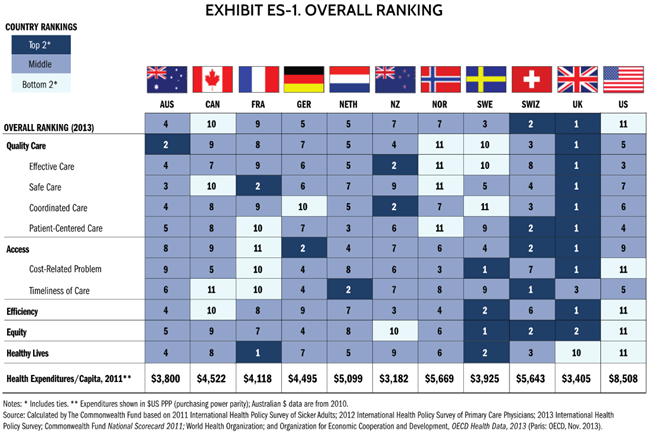 UK and 10 other countries, Health Care System Performance Rankings, courtesy of the Commonwealth Fund (2017) Click image to enlarge. For comparison purposes, I’ve included the 2013 Commonwealth Fund ranking graphic below. The Commonwealth Fund 2013 International Health Policy Survey in Eleven Countries, courtesy of the Commonwealth Fund (2013) Click image to enlarge. 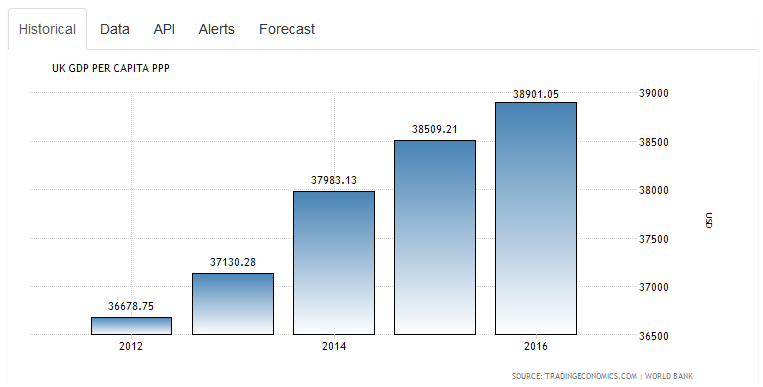 This chart shows GDP in Purchasing Power Parity (PPP) which illustrates that purchasing power of both UK citizens and expats is increasing — even though (according to some) the sky is falling every day! 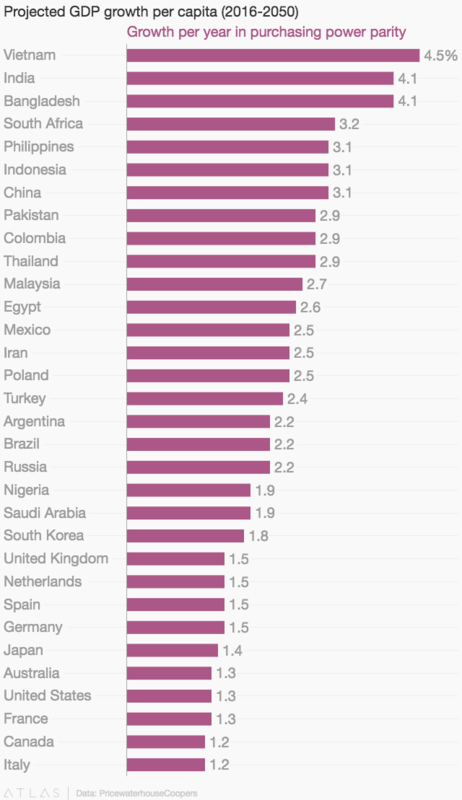 UK GDP per capita Purchasing Power Parity PPP. Source: tradingeconomics.com Click image to enlarge. With all of that going for the UK in 2017 (and more positives that I haven’t included because I don’t want to drown you in charts) you’d think that Prime Minister Theresa May would get plenty of respect from her party, from certain media outlets and from voters. But apparently in the United Kingdom, almost-perfect scores aren’t good enough to get the Prime Minister the majority she needed to allow the country to cruise through Brexit. And that’s a shame. On the sidelines of the G20 Hamburg summit, U.S. President Trump found time to meet with UK Prime Minister May and to offer welcome words that the United States will sign a bilateral trade deal with the UK as soon as Brexit is complete. It’s very good news for the UK and also for PM Theresa May (who has had a rough time in domestic politics of late) and it was obvious that the U.S. president went out of his way to assure Ms. May that a reciprocal trade agreement — one that works for both America and for Britain — is one of his administration priorities. So much of the UK’s post-Brexit success will hinge on bilateral trade accords because no matter how good the final Brexit agreement, there will be some amount of economic adjustment for Britain in the months following Brexit. A quick trade agreement with the United States will not only ease the Brexit transition, but also improve the UK (and America’s) economy indefinitely. It was a classy thing for Mr. Trump to do for Theresa May knowing that her domestic political fortunes have taken a hit. Let’s hope the Prime Minister is able to return the favour at some point during the Trump administration. That sort of respect makes for strong allies. During WWI, but especially during WWII the relationship between America and Britain was raised to a very high level by Prime Minister Winston Churchill and President Harry S. Truman, and in the postwar era during a time of unprecedented economic growth, President Ike Eisenhower continued the wise course set by his predecessor. However, it could’ve so easily gone the other way if the leaders hadn’t gotten along. Both sides would’ve missed geopolitical opportunities of huge importance such as the formation of NATO, the establishment of the Nuremberg trials and the creation of other institutions and agreements such as Bretton Woods and the IMF. Without the ambition of the UK and the power of the United States those things simply wouldn’t have occurred. Millions of Americans and Britons prospered over the past 72 years because their postwar political leaders *didn’t drop the ball* and made a conscious decision to *make the best of the postwar relationship* for their respective people. It will have taken eight years to hammer out and begin to abide by, the Comprehensive Economic and Trade Agreement (CETA) which arrives so late in the game and market conditions do change over time (remember way back to the 2008/09 financial crisis when the CETA agreement was first floated?) that some of the hard-won negotiating points are no longer relevant and may never be finalized. I’m sure it’s a fine agreement and congratulations are due. However, with America and Britain at the controls of a mutually beneficial trade agreement between two friendly Anglophone nations, it should take less than a year from first discussion to signed agreement. Though we don’t know what shape an Anglo-American trade agreement might look like from our vantage point in July of 2017, probably the best idea would be for both sides to embrace reciprocity and fair dealing in all trade matters as a way to enhance both economies, and as a way to later attract other Anglophone nations such as Canada, Australia and New Zealand to sign on to such an agreement. What a great thing it would be if all Commonwealth nations eventually agreed to sign on to a U.S. / UK trade agreement. Commonwealth of Nations member India has 1.5 billion consumers alone! Both America and Britain could add 5% to their respective GDP just on the improved trade flows of doing business in the booming Indian economy. “Although India’s rapid population growth is part of what accounts for the forecasted jump […] that is only part of the story. Drastic improvement in terms of per-person productivity due to capital investments and better technology will play an even more important role. “PwC predicts that India’s economy will grow by about 4.9% per year from 2016 to 2050, with only 0.7% of that growth caused by population growth. Both America and Britain just need to hit the right note with India — a respectful note — in order to profit from the massive growth that is available in that burgeoning country. Working out an Anglo-American trade agreement with a view to adding all Commonwealth member nations within 24 months, guarantees that other powerful trade blocs don’t beat the Anglo-American alliance to supply the rocketing Indian economy with much-needed goods and services. UK Brexit free trade deal with United States and with Commonwealth partner India. Britain has the Commonwealth of Nations connections, Britain needs a trade agreement with NATO ally America and with Commonwealth partner India, and the United States wants to increase mutually beneficial trade with Britain and its 2-billion-strong Commonwealth partners. In all of human history, rarely has such a synergistic match-up suddenly appeared where different but extremely valuable benefits are available to all three parties. Just as nobody predicted the massive Japanese economic boom which began to form the day after WWII ended, an Anglo-American trade agreement, followed by a Commonwealth trade agreement (before other trade blocs grab the low-hanging fruit!) could match or exceed the massive performance statistics of the postwar Japanese economy. Dear United States and Commonwealth of Nations, Let’s not miss this rather obvious ‘Win-Win-Win’ opportunity!